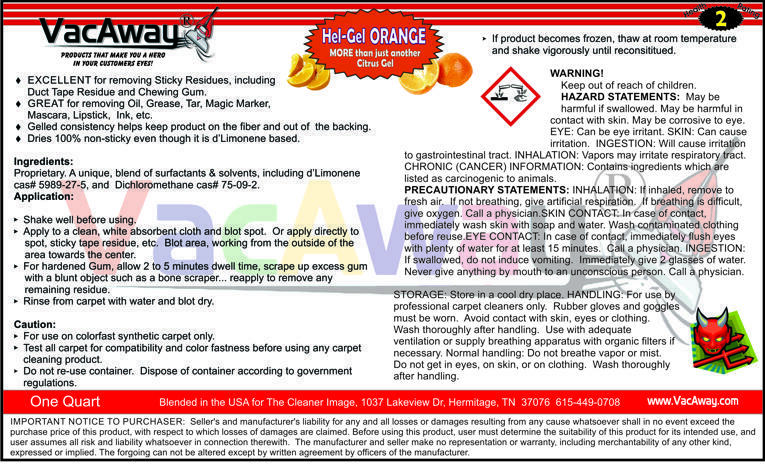 The cleaning industries only, d'Limonene based, non-sticky citrus-gel... very effective on GUM, Tape Residue, etc. EXCELLENT for removing sticky residue of many kinds; including Duct Tape Residue and Chewing Gum. Great for removing oil, grease, tar, magic marker, mascara, lipstick, ink. etc. Gelled consistency helps keep product on the fiber and out of the backing. Dries 100% non-sticky even though it contains a high percentage of d'Limonene. From Thomas Holley of Centerville, Ohio on 9/27/2017 . Great product. If it's gum, wax or oily spots, it's Hel-Gel time!! From Anonymous of Louisville, Kentucky on 9/29/2016 . Love Hel-Gel. It's the main spotter we use for unknown spots, especially those dark oily spots. From Dane of Surprise, Arizona on 8/20/2015 . Works great on gum and many other spots. Nice to use when you don't want your spotting solution to run down. Does not leave a sticky residue.